CUHSD is launching a #WhyITeachInCUHSD series to highlight our teachers and their experiences at CUHSD schools throughout the recruitment season. We hope their stories will inspire others to join the CUHSD team. The series comes during a time of severe shortages of qualified teachers, particularly in science, math and special education. Last week we highlighted Boynton High School social science teacher Jeffrey Gray. 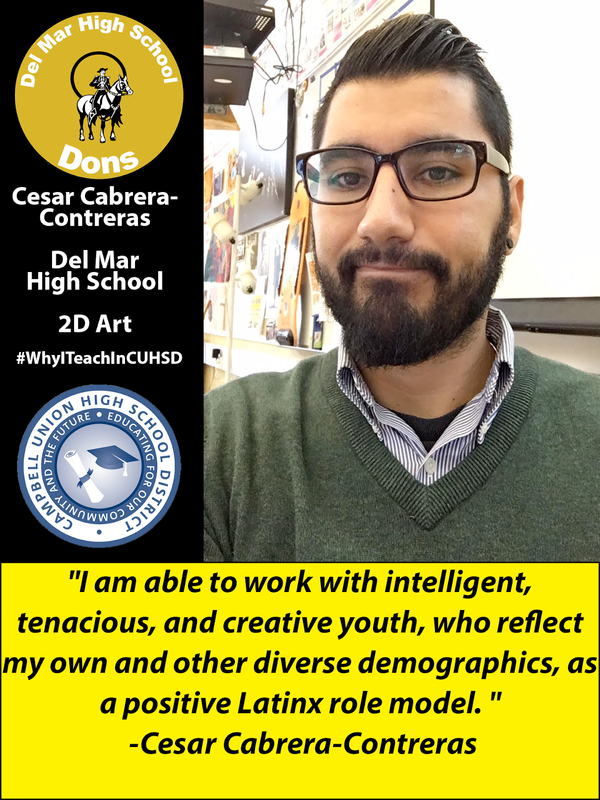 This week we are highlighting Del Mar High School 2-D art teacherCesar Cabrera-Conteras, who found his love for teaching during his time as a student at CSU Long Beach. He joined “Mini-Corps”, which is an organization that serves migrant students. As a migrant himself, he wanted to help support the next generation of migrant students. “I loved the way I was able to share my passion for art with high schoolers and connect with them, “ said Cabrera-Conteras. After receiving his teaching credential, he wanted to join the Del Mar High School team after seeing the enthusiasm of the staff and Principal Jennifer Baldwin’s ideas for students success-- such as restorative justice and growth mindset -- aligned with the school’s vision. Additionally, he loved the diversity and culture of the students of Del Mar High School. "I am able to work with intelligent, tenacious, and creative youth, who reflect my own and other diverse demographics, as a positive Latinx role model, " said Cabrera-Conteras. To learn more about the #WhyITeachInCUHSD campaign, visit social media pages. Interested in joining the CUHSD team? Click here to find out more about employment opportunities in CUHSD.